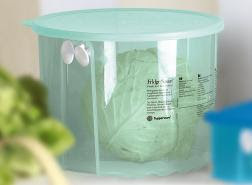 Tupperware FridgeSmart Containers - Keep Fruits and Vegetables Fresh Longer! Are you having trouble keeping your fruits and vegetables fresh in the fridge? 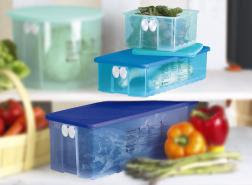 Tupperware's FridgeSmart Containers is the perfect solution! See the little buttons on the containers in the picture? Those are there because certain fruits and vegetables need more or less air to keep them fresh. Tupperware's FridgeSmart containers also have a handy grid on the side panel that will tell you how to vent your fruits and vegetables like one vent open, two vents open or both vents closed. When I first tried the FridgeSmart containers, I was amazed that my strawberries and mushrooms lasted in the fridge for 2 weeks! When you purchase your fruits and vegetables from the store, do not wash them, just place them in the FridgeSmart Containers. Washing prior to storing in the fridge can cause your fruits and vegetables to decay. (Strange but true!) When you are ready to use the fruits or vegetables just take out what you need and rinse them off and use them like you normally would! We have a variety of sizes and shapes available. The container pictured to the right here is the new lettuce keeper. You can store a whole head of lettuce, cabbage, brocolli and cauliflower! Visit my Tupperware website to learn more about the FridgeSmart containers and other products that are designed to keep foods fresher longer! If you have any questions or comments please contact me! FINAL WEEK: Up to 50% Off Spring Offers + Exclusive Buys & More! Tupperware was recently featured on CBS news! Click below to watch the video! Would you like to try out the Tupperware opportunity? Let's talk! Just visit my Tupperware website to learn more and to contact me! Join Tupperware in March and Get These! Every new Consultant who starts a Tupperware business during March 1–28, 2008, qualifies to purchase the Ice Prisms™ Pitcher & Tumbler Set for $15! * A $69.50 value, this 5-pc. 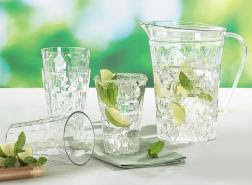 set includes 2-qt./2 L capacity Pitcher and four 16-oz./500 mL Tumblers. As beautiful as they are durable, the faceted surfaces of the Ice Prisms™ Pitcher and Tumblers add glamour and sparkle to any table. 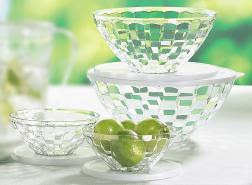 Start your Tupperware business March 1–14, 2008, and when you achieve $300 or more in sales during your first 30 days, you qualify to receive the Ice Prisms™ Small Bowl Set and Ice Prisms™ Large Bowl FREE! It’s a terrific addition to your product demonstration collection. Learn More about Joining Tupperware! Fill out the form below and the information will be emailed to you!